This forest type is derived from The Nature Conservancy's Terrestrial Habitat Classification data. Pitch pine and scrub oak are the primary species found in this forest type on dry sandy soils. Pitch pine-scrub oak forests are adapted to warm and dry environments, including the extensive sandplains in central and coastal MA, and are expected to be positively affected by future increases in temperature and declines in precipitation. Given that these are fire-adapted ecosystems, future increases in fire occurrence in these communities, although a potential human hazard, could help promote and maintain habitat conditions (shrublands and woodlands) for numerous species of special concern in the state. 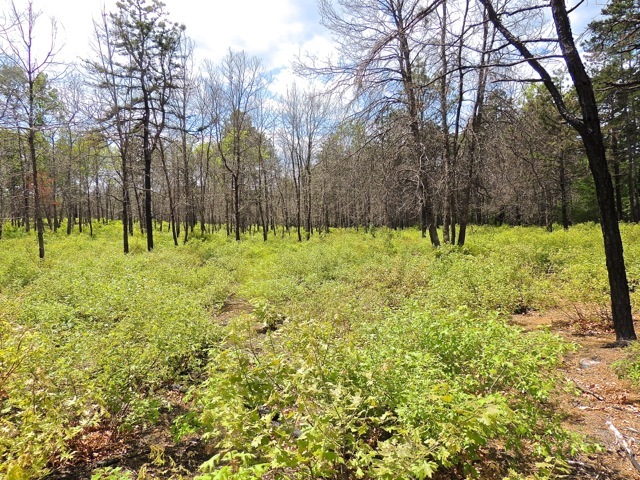 The southern pine beetle has recently expanded into pitch pine-scrub oak communities in Long Island, NY, and Connecticut. Its further expansion into MA could greatly impact the future of pitch pine in these forests. Projected change in suitable habitat in the year 2100 based on Tree Atlas projections. Values in parentheses indicate whether suitable habitat for species will increase (+), decrease (-), or stay the same (0) under projected climate change. The first value corresponds to a lower emissions (PCMB1) scenario whereas the second value is based on a high emissions scenario (GFDLA1FI). Management efforts should target species that are not expected to decline under either scenario. For more information on the likely impacts of climate change on specific species, visit the U.S.D.A. Forest Service's Climate Change Tree Atlas. Janowiak, M., et al. In preparation. New England Forest Ecosystem Vulnerability Assessment and Synthesis: A Report from the New England Climate Change Response Framework. U.S. Department of Agriculture, Forest Service, Northern Research Station. Manomet Center for Conservation Science (Manomet) and Massachusetts Division of Fisheries and Wildlife (MA DFW). 2010. Climate change and Massachusetts fish and wildlife: Volume 2 habitat and species vulnerability. Massachusetts Division of Fisheries and Wildlife, Westborough, MA.